Are you an expert at managing creative campaigns, but stuck when it comes to your job search campaign? To be a successful candidate for art director jobs, resume expert Kim Isaacs says it helps to have a comprehensive resume. 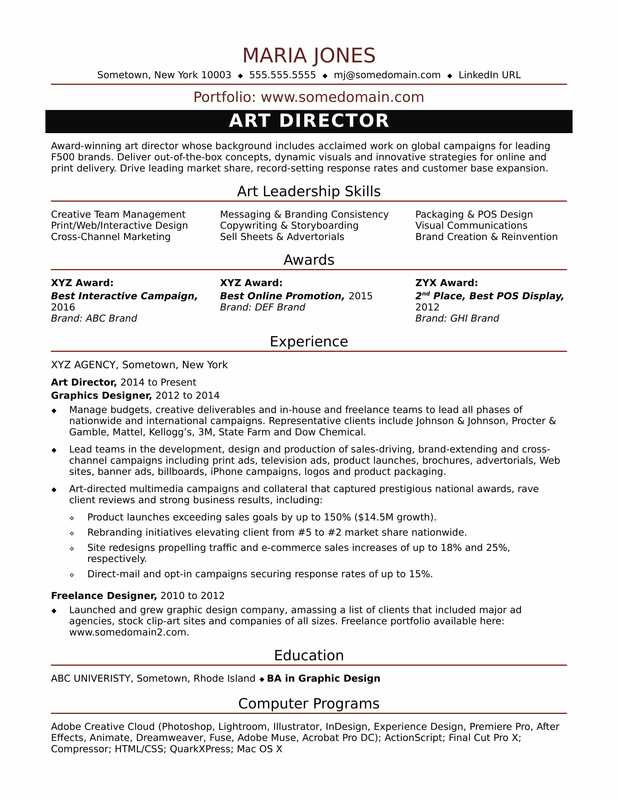 To see how you can highlight your creative leadership skills, view this art director resume sample that Isaacs created below, and download the midlevel art director resume template in Word. And if you need more help, get a free resume evaluation from the experts at Monster's Resume Writing Service. Jobs for art directors are projected to grow by 5% (or 4,900 jobs) from 2016 through 2026, according to the Bureau of Labor Statistics (BLS). You'll find the highest level of employment for this job in the following states: New York, California, Illinois, Texas, and Massachusetts; and in the following metropolitan areas: New York City, Los Angeles, Chicago, San Francisco, and Boston. As an art director, you can expect to earn a median wage of $92,500 per year, or $44.47 per hour, according to the BLS. Award-winning art director whose background includes acclaimed work on global campaigns for leading F500 brands. Deliver out-of-the-box concepts, dynamic visuals and innovative strategies for online and print delivery. Drive leading market share, record-setting response rates and customer base expansion. Manage budgets, creative deliverables and in-house and freelance teams to lead all phases of nationwide and international campaigns. Representative clients include Johnson & Johnson, Procter & Gamble, Mattel, Kellogg’s, 3M, State Farm and Dow Chemical. Lead teams in the development, design and production of sales-driving, brand-extending and cross-channel campaigns including print ads, television ads, product launches, brochures, advertorials, Web sites, banner ads, billboards, iPhone campaigns, logos, product packaging and more. Product launches exceeding sales goals by up to 150% ($14.5M growth). Rebranding initiatives elevating client from #5 to #2 market share nationwide. Site redesigns propelling traffic and e-commerce sales increases of up to 18% and 25%, respectively. Direct-mail and opt-in campaigns securing response rates of up to 15%. Launched and grew graphic design company, amassing a list of clients that included major ad agencies, stock clip-art sites and companies of all sizes. Freelance portfolio available here: www.somedomain2.com.